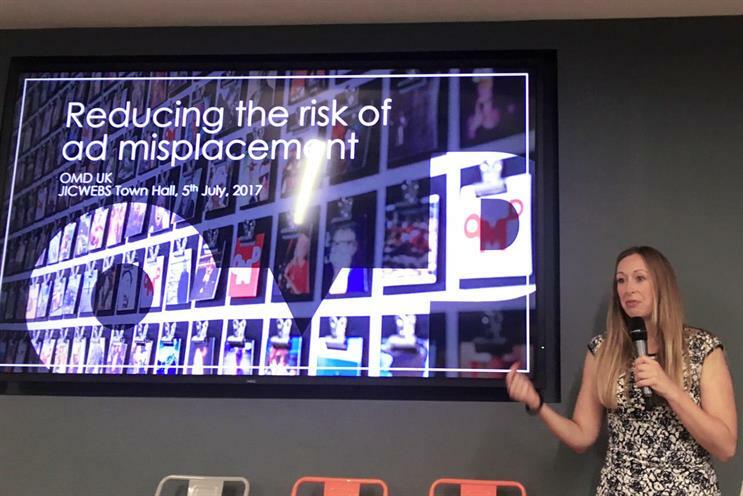 The industry has progressed greatly in terms of raising the standards of brand safety and viewability, but there is much more to be done, the Jicwebs Town Hall has concluded. Ryder: "There has been a decrease in ad placements on fraudulent sites." Yesterday's Town Hall around raising trust in digital advertising was organised by the now full-time Jicwebs organisation and involved media agencies, media owners, ad tech vendors and marketing representatives. Attended by around 300 people, the event was standing-room only, more than double the attendance of similar events last year. "2017 is the year that many more people started engaging on this topic," Richard Foan, executive chairman of Jicwebs, said. While this has something to do with the recent trend of media organisations calling out brands advertising against extremist content online Foan believes it's fundamentally linked to the sheer amount of money invested in online advertising. Last year in the UK, digital ad spend alone rose 17.3% year-on-year to £10.3bn, despite numerous concerns around brand safety, viewability and ad fraud. "Those investing now want their own insurance policies in place," Foan said. But Mark Finney, director of media and advertising ISBA, said that media coverage has a lot to do with it. "The industry’s got the attention of the advertiser now in a big way. There is a real fear among advertisers, beyond their brand safety and that is if they are going to appear on the front cover of The Times. Are they going to be carpeted by the chief executive?" Verification services are making a difference, Stuart Hall, technology commercial director of Group M said during his presentation: "We used to have 'Monday morning incidents' with a client whose digital manager was very due diligent on 'certain websites' on the weekend. That client might come across their ad on these websites and would take a screenshot and complain on Monday. But, since we started working with verification vendors, the Monday-morning incidents went away." The hard truth, though, is that if someone looked hard enough they could probably still find an ad running somewhere problematic, he added. "What we've found worked best is a proposal of combining curated inventory plus verification." It has to be noted that tech is not fool-proof, Suzy Ryder managing partner - digital and technology of OMD UK agreed. "Something has to be seen to be classified. It needs around 100 impressions before the tech kicks in. That means someone has to see it first." Something else that has been working is the industry's efforts to improve governance around quality ad placement, Ryder said. "It's important to acknowledge that there has been a decrease in ad placements on fraudulent sites." Issues the industry needs to work on, via Jicwebs, agreed attendees is establishing universal standards of measurement. "Standardisation across measurement methodology across the various partners would be exceedingly helpful but we're not there yet," Lysan Somanchi, head of EMEA supply at AdRoll, said. "There is no standard across markets and a global standard would be appreciated." The industry also has to move away from its obsession with clicks, Paul Wright, chief executive of iotec pointed out. "Most fraudulent websites have very high click rates and by making clicks a KPI, you can wind up targeting media towards something with a higher propensity to fraud." The approach of Jicwebs going forward, is as it has always been, is to favour realism over idealism, Foan said in response to a question about a potential boycott of non-certified vendors and media owners. "We believe though that by continuously improving the opportunity for trusted digital inventory and trading, by conducting audits, that advertisers will choose to invest more with certified companies," he added.